The FFB funded Munawar School takes students up to 5th grade. After this, students have to travel to the district town of Khapulo to continue their education. Other alternatives are the larger town of Skardu or even Islamabad. The richer families are able to relocate their children so that they can continue to receive quality education in English. Children in poor families are forced to enrole in the local government schools where they are educated in Urdu. This inequality means that the division between the rich and poor gets wider with each generation. FFB scholarships to selected students have helped to overcome this in individual cases. To help a much larger number of children, the FFB has introduced a 'pick up and drop' jeep service between many of the villages in the Hushe Valley and the school in Khapulo. 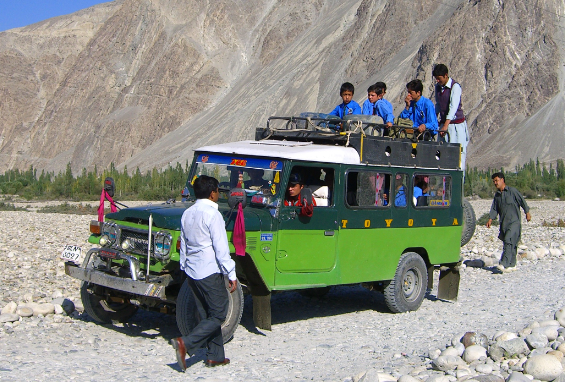 This enables poorer students to access the best education in the area, but it is no picnic for the students - the jeep ride from the more distant villages takes a long time with the students riding on the inside, outside and top of the vehicle!